Chlorine dioxide’s oxidation reduction potential (0.95V) is much lower than chlorine (1.36V) CLO2 oxidation capacity = (5 electrons) this is much greater than that of chlorine only (2 electrons).The oxidation reduction potential (ORP) measures an oxidizer’s strength or speed at which it reacts with an oxidizable material. Although chlorine dioxide has a low ORP, it is more selective as to the types of oxidizable materials with which it reacts. Chlorine dioxide targets specific organic molecules including cysteine, tyrosine, methoionyl, DNA and RNA. The oxidation capacity indicates that on a molar basis chlorine dioxide has a greater capacity for disinfecting over chlorine. 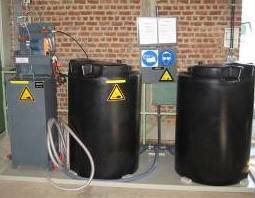 The selectivity and oxidation capacity of chlorine dioxide makes it a stronger oxidative disinfectant than chlorine. 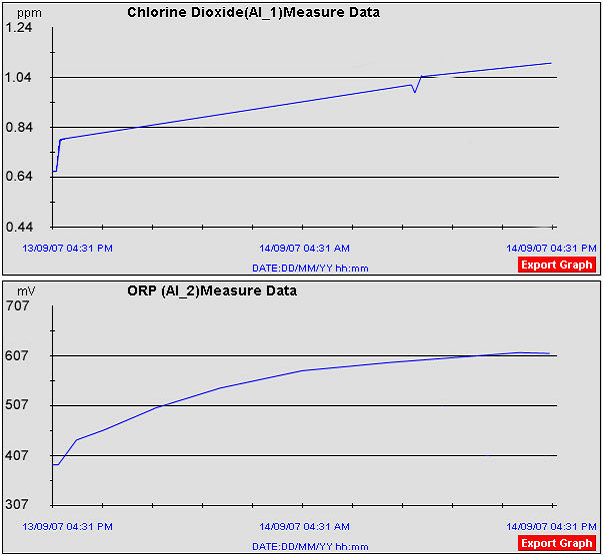 Hereby some info regarding ORP and ClO2 where you can see that 600 Millivolt is reached at a dosage of around 1 ppm. This was at a food processing company. Please keep in mind that the quality of the feed water is important for this and also the temperature can have an effect. We have 2nd customer who is washing with our chlorine dioxide and needs a level of 2, 5 ppm in the water to have 600 Millivolt. He has more organic material in the feed water.